Elevator dress shoes with upper in blue calf leather, hand-buffered to obtain delicate shades of colour. The real leather sole is stitched at sight. 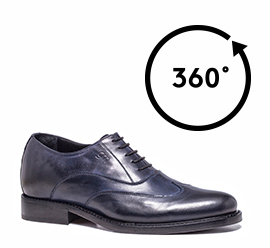 A shoe with an inner elevator system able to increase height from 2.4 (6 cm) up to 3.1 inches (8 cm) ideal to add refinement to any outfit. Made in Italy.